Uruguay coach Oscar Tabarez is determined to show that Paul the Octopus is not always right in his predications, by defeating Germany in the third-place play-off. Soothsayer: Paul has been impressive in his predictions thus far. Will he be right again? Tabarez has claimed he does not believe in soothsayers, but the selection of Germany to triumph in the third-place play-off by the world's most famous mollusc has given his team further motivation ahead of their clash at the Nelson Mandela Bay stadium on Sunday. "It's not just a matter of beating Germany but also beating the octopus," Tabarez said. "It would be absolutely spectacular, and I think it is possible. "[It] would send a message to everyone by saying nothing is impossible in football." 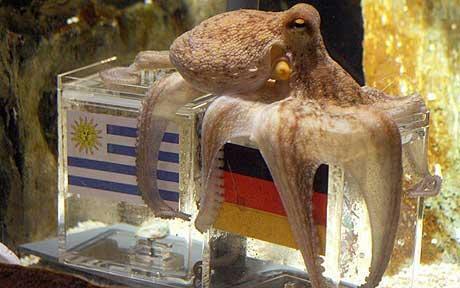 The octopus has correctly predicted the result of all six of Germany's games – including the semi-final loss to Spain – and five out of six matches at the 2008 European Championship. While Paul may be optimistic about Germany's chances, Joachim Löw's side are struggling with injuries and illnesses at present. Captain Philipp Lahm and forward Lukas Podolski missed Friday's training with a cold. While Miroslav Klose had some fitness tests on his back injury in the team hotel and backup goalkeeper Tim Wiese is struggling with a knee injury. However, despite their fitness concerns, Germany are still the favourites, according to Tabarez. "Since 1934, Germany has been participating all the time in the World Cup and Germany has written a great history in the book of the World Cups," he said. "Before the match against Spain this [German side] had been the best team of the tournament, so this is very motivating for us. We recognise this match will be difficult but we don't think it will be impossible." Uruguay are also playing for a little piece of history, as victory would give the South Americans their best finish at a World Cup since winning their second title in 1950. "We have overall delivered great performances," Tabarez said. "I think overall it has been a great World Cup [for Uruguay]." Tabarez also said strikers Diego Forlan and Luis Suarez, who is back after a one-game suspension, will both start. Forlan, who is fit after being substituted in the semi-final loss to Holland with a right-thigh injury, has scored four goals at the World Cup, just one behind leading scorers David Villa and Wesley Sneijder. Forlan has also been nominated for the Golden Ball – awarded to the best player of the tournament – but Tabarez said the striker was not focused on personal awards. "It's a matter of standing up for our country and he has done so," Tabarez said. "It would be great for Uruguayan football if he was taken into account as one of the top players [at the World Cup] ... but he is not going for that. It is a collective sport."